Facing the possibility of breaking an heirloom treasure can be a scary proposition. Whether it's through use, cleaning, storage or moving, accidents can and do happen. Shy of breaking down for a good cry, what can you do when one of your lovely pieces of china gets broken? Contacting a matching service is a great place to start when mending your broken set. Good china replacement services will stock thousands of pieces of China. Some are old patterns, some newer. They range from heirloom china to bridal registry patterns and even the dishes that were once distributed in grocery stores throughout the country. Some services keep a computerized inventory of your china pattern(s) on file and snail mail or e-mail lists of current stock every six months or so. Even if you haven't recently broken or damaged a piece, it might be a good idea to subscribe to one of these mailing lists, especially if you're actively adding to a set. Receiving a listing of available pieces makes it easier to add a few things you need to expand your place settings and add serving pieces. 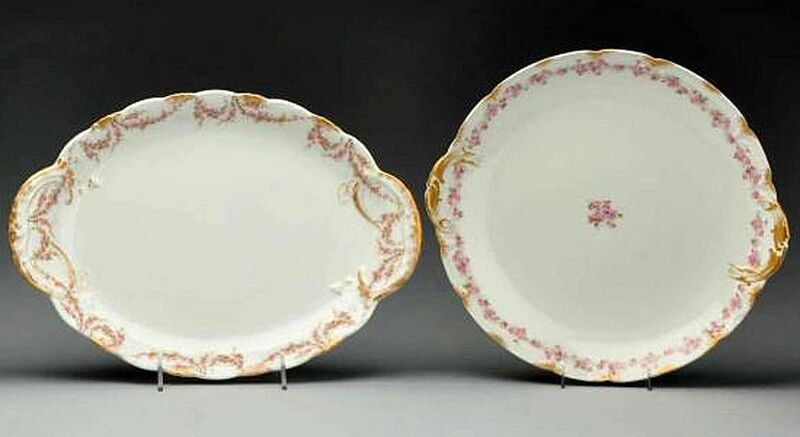 Different pieces were often distributed to various parts of the country when new making it difficult to obtain a truly complete set without a little guidance, especially when shopping for discontinued patterns or true antique china like that made by Haviland or other wares marked Limoges. If you contact a china matching service to help you identify a discontinued pattern, remember to provide as much information as possible to obtain the best results. Look on the backs of dinner plates and serving pieces for the manufacturer, pattern name and/or a pattern number. When you call or e-mail, simply give the service this information. In turn, they'll probably be able to tell you a little about the manufacturer, production dates, whether it's still being produced and the pieces they currently have in stock. If none of your china pieces have a mark on the back, the best way to have the pattern identified is providing a matching service a clear photograph, color copy or drawing of the pattern noting the colors. "When we see it, we frequently know it," said David Lackey, Antiques Roadshow appraiser and former owner of a china matching service, in a Web interview. One thing to keep in mind with current production patterns is that china matching services may not be the most economical way to shop. Department store sale prices and outlet centers usually offer better discounts, and you can always check online auctions as well. For discontinued patterns, however, a china matching service can often be your best bet. This is particularly true when you need a piece in a hurry. Waiting to run across your china in an antique shop or browsing online may be a painstaking process unless you have an extremely common pattern. Finding a china matching service can be as simple as picking up one of your favorite magazines such as Southern Living or Country Living. Publications featuring collectibles and tableware in their spreads often run china replacement advertising, Lackey added. Your local yellow pages may also offer some suggestions for shopping and many national companies can be found online doing a simple search. A good starting point online is Set Your Table (SetYourTable.com). The site features lists of dealers who stock china replacements both nationally and locally. Simply click on the manufacturer's name to get a list of dealers who stock china made by that company. This site also provides a useful section for repair/restoration company listings. There's no real reason to avoid replacement pieces to hold the original value of an heirloom set, but in some cases repairing an item that isn't damaged too severely can cost less than a replacement so it's worth considering.